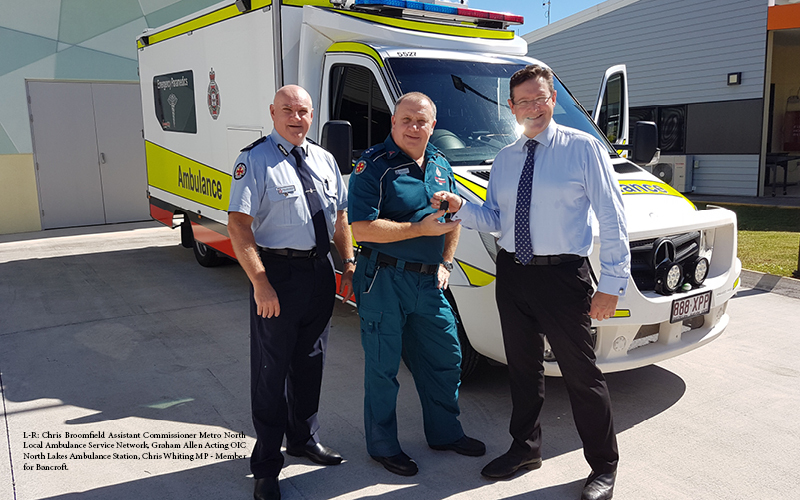 The keys to a new ambulance were handed over at the North Lakes Ambulance Station by Chris Whiting MP, Member for Bancroft. “The vehicle has been built locally in Bancroft by Varley, who are located in the Narangba Innovation Precinct,” Mr Whiting said. “The vehicle can carry two patients and is staffed by a specialised mixture of drivers and paramedics depending on the needs of the patients. “It carries state of art equipment for patients, but also to ensure the safety of Queensland Ambulance staff and other road users. “These features include lane sensors, rear sensors and the Emergency Vehicle Priority system, which triggers a green light at compatible intersections. “This is yet another example of the Palaszczuk Government’s commitment to growing Queensland jobs. This specialised patient transport van is a $230,000 investment by the Palaszczuk Government in the region. “What a pleasure it is to deliver this new resource to our hardworking ambulance officers and to our station at North Lakes,” Mr Whiting said. The North Lakes Ambulance Station, opened in 2012, is the largest Ambulance station in Queensland with a fleet of 11 vehicles and 34 staff.